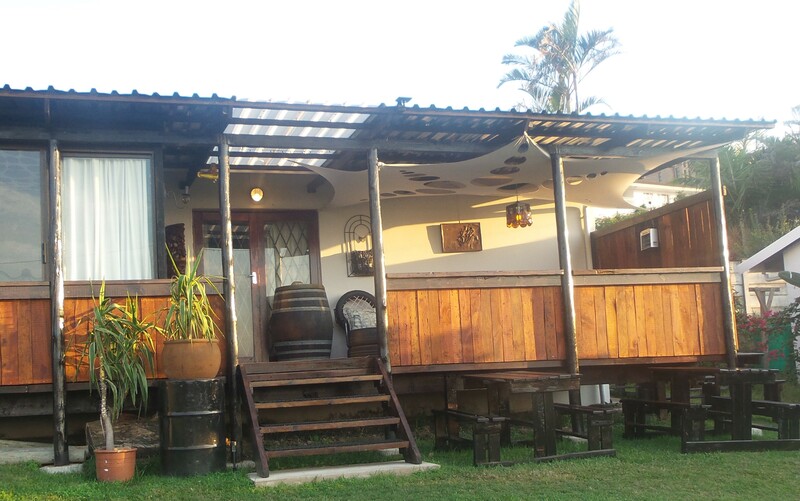 Conveniently situated between Durban’s King Shaka Airport (5km) and less than a 5 minute walk to the pristine unspoilt beach where the dolphins and whales cruise the bay. Encircled by tropical vegetation, a tranquil base from which to start exploring the magnificent Dolphin Coast of South Africa or have a last glance before you say good-bye and fly back home. . In our hostel you find calm, cosy and homely atmosphere, offering 8 rooms of different categories, which will appeal to tourists, business travellers, as well as transit passengers departing from DBN Airport. •Your destination is on the right-hand side.
. Guests can make use of the communal self-catering facilities. Features: One Double bed room with private patio, Shared bathroom, Sea views, Self-catering, No Smoking in Room. Guests can make use of the communal self-catering facilities. Double room on the deck with one double bed and locker.Best Sea Views Features: Double bed, Lamp, Locker, Shared bathroom , Self-catering, No Smoking in a room. This room is furnished with a double bed & table and chairs and a fan. Guests can make use of the communal self-catering facilities. Features: One Double bed, Shared bathroom, Sea views, Self-catering, No Smoking in Room. This room is furnished with a double bed & table and chairs and a fan. Guests can make use of the communal self-catering facilities. Features: Double bed, Shared bathroom, Self-catering, No Smoking in Room.